Altman is president of Social Security Works, Benesch is communications director for the group. They just wrote the piece “The Overlooked Trumpcare Threat: A Medicare Time Bomb,” which states: “Just over two years ago, Donald Trump gave a speech announcing his run for the presidency. In that speech, he promised that he would not cut Social Security, Medicare, or Medicaid. That promise became a centerpiece of his campaign. It was a key way for Trump to differentiate himself, as a matter of policy, from his Republican primary opponents — a distinction he happily and frequently pointed out. In the general election, the promise helped him appeal to voters who don’t traditionally support the GOP. “But six months into his presidency, Trump has already betrayed those voters by breaking his promise. Indeed, rather than protecting those programs, he has already, in his short tenure, gone after all three! 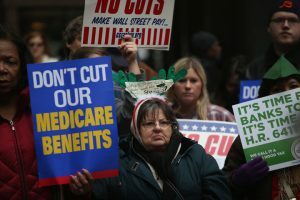 “The destruction of Medicaid and the cutback to Social Security have gotten media attention. The broken promise on Medicare is in danger of slipping by beneath the radar, though. “Only days after the election, Speaker Paul Ryan announced that he saw an opportunity to realize his decades-long dream of destroying Medicare. He said that he planned to enact legislation as soon as possible that would end Medicare’s guaranteed benefit and replace it with voucher coupons. “Ryan justified this horrible plan — destined to leave the nation’s seniors without medical care after a lifetime of work — by claiming ‘because of Obamacare, Medicare is going broke.’ Nothing could be further from the truth. The Affordable Care Act improved Medicare’s long-term finances, by requiring the wealthiest Americans to pay somewhat more. Trumpcare repeals that increased funding.